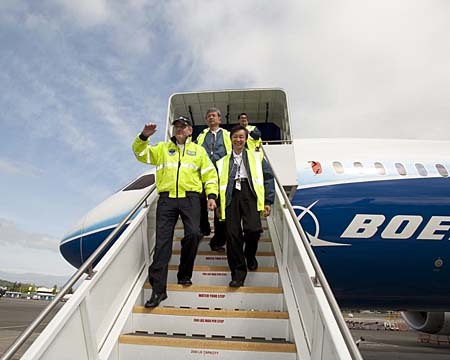 SEATTLE, May 13 /PRNewswire-FirstCall/ -- Boeing (NYSE: BA) and two ANA (All Nippon Airways) pilots flew the Boeing 787 Dreamliner for the first time Wednesday. The airplane they flew is the first of six flight-test airplanes. The two-hour-and-40-minute flight took place over Washington state. Flying the 787 for the first time were ANA pilots Capt. Masayuki Ishii, director of 787 pre-operations planning, and Capt. Masami Tsukamoto, manager of 787 pre-operations pilots. On board were Capt. Mike Carriker, Boeing 787 chief test pilot, Capt. Christine Walsh and Scott Fancher, vice president and general manager of the 787 program, Boeing Commercial Airplanes. "The flight was a customer demonstration for our launch customer's lead pilots to evaluate the 787," said Fancher. "We are extremely proud to have ANA on the flight, and have the opportunity to show what a great airplane the men and women of Boeing have created." The flight was conducted under a special airworthiness certificate granted by the U.S. Federal Aviation Administration. The 787 program was launched in April 2004 with a record order of 50 787's from ANA. ANA, which plays an active role as launch customer, is scheduled to take the first 787 delivery in the fourth quarter 2010. During the flight, both pilots performed multiple takeoffs and landings as well as other maneuvers that allowed them to feel the airplane's characteristics. The pilots also gained experience with other 787 flight-deck features, including larger display screens, dual head-up displays and dual electronic flight bag. "It was fantastic and an incredible experience," said Capt. Ishii. "ANA passengers are in for an incredible experience when they fly on the 787," he said. "The flight was fantastic," said Capt. Tsukamoto. "I've been waiting for this day since we made the launch order, and today my dream came true." During the flight, Carriker showed the ANA pilots, who are both rated on the Boeing 777, the similarities and differences between the two airplanes. Pending regulator approval, it will take as few as five days of training for 777 pilots to become qualified as 787 pilots. Customers around the world have ordered 860 787s since the program was launched in April 2004, making the Dreamliner the fastest-selling new commercial jetliner in history.